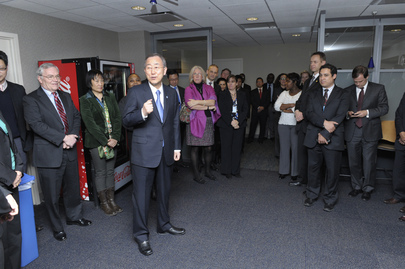 UNITED NATIONS, January 6 -- Ban Ki-moon's relations with the press, particularly the Korean press, were on display Thursday at the UN. Inner City Press asked Nesirky if Han Seung-soo is still functioning as an advisor to Ban on climate change, and if he was speaking for Ban. Nesirky replied that Ban too busy on such issues as Cote d'Ivoire and Sudan, which Inner City Press also asked about, to have time for the Korea Herald article. Then Nesirky abruptly called the day's noon briefing to a close, say that Ban was about to tour the press area. Upstairs, Ban and his titular chief of staff Vijay Nambiar moved slowed around the press floor, shaking hands and commenting on whether the cubicles are adequate for journalism. Inner City Press said that enclosed walls were needed for “quiet diplomacy,” at which Ban laughed. After touring the cluster of Japanese media desk in what has been dubbed the A or Asian room, Ban was shown the entirely empty side of the room devoted to Korean publications. Ban read their names. An enterprising journalist informed Ban that often the Korean do not come in to use their desks, while other reporters need space - and some long time reporters are being ejected from their UN desks. While Ban did not respond to this, Choi Soung-ah who works in Nesirky's office told the reporter that “we are aware of that.” Inner City Press has previously reported on this -- click here, and watch this site. 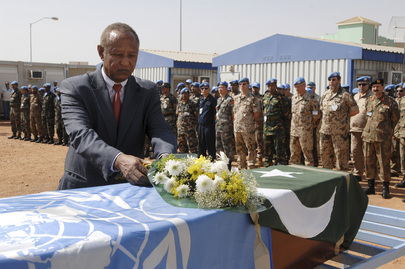 UNITED NATIONS, January 5 -- The Sudanese administration of Omar al Bashir blocked even food resupply to UN peacekeepers near Khor Abeche in South Darfur last month, a senior UN official off-handedly told the Press on Wednesday. At a UN background briefing about the upcoming South Sudan referendum, Inner City Press asked the senior UN official -- who insisted on being identified that way -- about the lack of human rights reporting by the African Union - UN Hybrid Operation in Darfur under the command of the UN's Ibrahim Gambari. The senior UN official responded that a forthcoming UNAMID report, apparently after the referendum begins, will document restrictions on access and movement imposed by the government and the Darfur rebels. The official said there have been 39,000 additional IDPs since the Security Council's visit in October 2010. The official cited the Tanzanian batallion for using their own food supplies to feed displaced people in Khor Abeche, and running out of food due to governmental prohibitions on resupply. The official said, "They were not able to be resupplied for days on end because the government was restricting our movements of our supply trucks." The question is, why wasn't this reported in real time by UNAMID? By contrast, last month both Ban Ki-moon and Alain Le Roy speaking about Cote d'Ivoire openly invited other members states to help break any blockade by Gbagbo forces on peacekeeper resupply. But in Darfur, the UN and Ibrahim Gambari stayed quiet. On the referendum, Inner City Press asked the official about the status of oil and water sharing talks, the division and possible forgiving of Sudan's foreign debt, and the citizenship rights of Southerners in the North. The senior UN official said that citizenship has still not be agreed on, predicting this will have to wait for a package deal including Abyei and the delayed popular consultation in Blue Nile state and South Kordofan. The official admitted that the UN is not much involved in the important debt talks -- Inner City Press has previously asked the IMF about this -- and said that water is as important as oil in Sudan. Inner City Press asked the UN official about South Sudan's announcement it will push out Darfur rebels. The UN official praised this, naming in particular Minni Minnawi "who has been in Juba." It was the Minni Minnawi group the government was attacking in Khor Abeche. A projected video hook up from UNMIS itself was not held. Inner City Press asked the senior UN official to explain UNMIS chief Haile Menkerios' praised of Omar al Bashir's “courage” and leadership. The senior official official essentially repeated the praise, calling Bashir's recent statements unexpectedly positive. He noted that "Senator Kery made some positive remarks." But what about the outstanding indictments for genocide and war crimes? Watch this site.